For the most natural, flattering skin tones, and skin that glows, choose a room with lots of window light. If this room isn't large enough for yourself and all your bridesmaids to get ready, you can always pop over there for your makeup application and putting on your dress and jewelry (the most important getting ready shots). Just think - "Is this a moment I want photographed?" If so, florescent or yellow toned overhead lights probably aren't going to provide the lighting you want. Nothing gets in the way of strong, clean photos like clutter in the background. If lots of people are getting ready together, have people keep all their stuff/bags in another room, and only bring things they're using into the getting ready room. You can also make a point to tidy up before the photographer comes. When the photographer arrives, they will probably want to photograph all your little details first - these include shoes, jewelry, rings, dress, and possibly bouquets and boutonnieres. Having these items together and ready to give your photographer will make sure your morning runs smoothly! This is all dependent on you and what will make you feel calm and ready for the big day of socializing ahead. While some would love nothing more than a room full of their friends, others might appreciate a quiet morning with one or two people. Cultivate a space that will allow you to be the best you for the rest of the day. As far as your wedding day "flow," taking family portraits BEFORE your ceremony generally works best. This way, everyone is free to party the moment you walk back up the aisle as husband and wife. However, if you don't want to see each other until the moment you walk down the aisle, this obviously won't work out. In this case, take portraits directly after the ceremony is fine. Pro Tip1. Have your officiant ask all family to head to a specific location after the ceremony for photos. Make sure and provide your photographer with a list of all the family portrait combinations you'd like. Most will ask you, but if not, have the list ready for them. P.S. This list doesn't have to just be family - maybe you want a photo with all your high school or college friends - that's cool too. Many people think they'll have time for these pictures at the reception, but never get around to it, so I say, take it now! 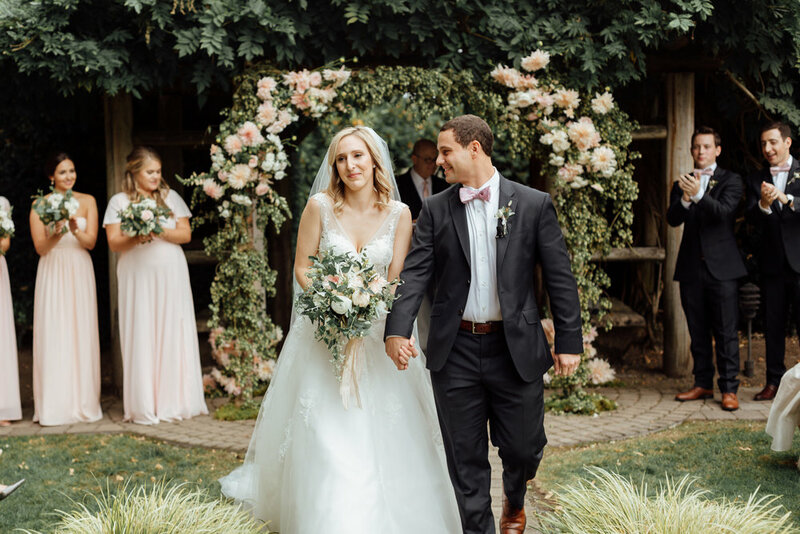 The weather, time of day, and location of your ceremony all have a significant effect on how your photos will turn out. While we often think direct sunlight is ideal lighting for pictures, standing in the shade actually produces more flattering, even shadows. If you score a sunny day for your wedding and want to have the ceremony in the middle of the day, consider 1. Finding a covered area for your ceremony, or 2. Having the ceremony later in the day when the sun is lower in the sky. If you score cloudy weather however, any time of day is great! And the more exposed to the sky you can be, the better! Warm, soft shadows. Romantic Vibe. Want to add some magic to your first kiss or journey back up the aisle? Give your guests something to throw on you! Biodegradable items are generally less hassle as far as cleanup, like flower petals, rice, or colored paper, but if your venue allows it, try big pieces of glitter or confetti. By now you've probably figured out that the most important element of your wedding day (for great pictures at least) is, you guessed it, lighting!!!! Natural daylight is the best because it isn't too warm (yellow) and it isn't too cool (blue). However, now that it's evening, you'll probably need to consider lighting options. 1. Colored up-lighting (common in hotels or large indoor venues, ballrooms) If you must have colored uplighting, choose cool colors like blue, green, purple, and NOT red, orange. But white or yellow light is best. Believe it or not, this is actually a hot topic in the photography community. Photographers are a little different than other wedding vendors, in that they spend the entire day with you - sometimes up to 10hrs or even 12hrs - They don't have time to take breaks to eat, so the start of the dinner hour is an important time to sit down, eat and relax before starting up again for toasts. Most photographers will eat at the same time as the bridal party, and before your guests, so they're ready to get back to work as soon as possible. You'll definitely want to make sure and arrange either 1. A plate is provided either via the buffet or a table 2. A vendor meal is arranged. If you do choose a vendor meal and want to earn bonus points with your photographer, as them if they have any dietary restrictions first :) 3. Set aside an hour for your photographer to leave the premises to find a meal. A big send-off can make for one of the most photogenic moments of the night. Couples often "fake" a send-off for this reason alone. If there's still daylight, try giving guests confetti, flowers, or rice to throw on you as you run through everybody to your car. If it's nighttime, sparklers are a GREAT option. Some couples have tried using glow sticks instead if sparklers aren't allowed at their venue - however glow sticks really don't emit enough light to light up a photo, so I'd skip this option if you're only doing it for the photos. Enter your email below to be the first to know about news, promotions and updates to Kelly Robbins Photo & Film!